Pammy Blogs Beauty: Bloggy Times in Atlanta! Make Up For Ever Makeup Bag Remix and MABB Meet up! Bloggy Times in Atlanta! Make Up For Ever Makeup Bag Remix and MABB Meet up! Hello lovelies! Last weekend was quite a bloggy weekend! :) I had two fun blog-related events and I just wanted to share some photos and thoughts with ya'll! The general premise of the Make Up Bag Remix event is that you bring your own makeup bag stuffed with products you either don't use or don't know how to use well and the MUFE artists will show you how to use your items better. I arrived armed with tons of products including a smokey eye kit and bright lippies. As much as I love bright lip color and smokey looks, I don't reach for those items often. My Bestie Jamie and I had very different experiences. Jamie's artist showed her how to use eyeliner and used many of the products in her make up bag. My artist showed me how to create a natural smokey look with neutral shadows and how to use bright pink lipstick with neutral lip liner. While my makeup artist looked through my bag and talked to me about my products, she didn't actually use any of the products that I brought. So, I was a little dissapointed in that. However, the look she did turned out pretty cute. It certainly was a different look for me! Also, I am extremely impressed with the performance of MUFE's concealers! I am quite certain that my next concealer purchase will be MUFE's HD concealer. We both got our pictures taken and left with a cute Make Up For Ever makeup bag containing a few MUFE products. What a fun afternoon! If the Make Up For Ever Remix tour hits your city, I highly recommend it for a fun afternoon outing! :) The Makeup Artist that worked on me was very sweet and talented. She does freelance work in Atlanta. I have her contact info if anyone is looking for a makeup artist! Photo Credit: Mandy's Secrets: Pictured left to right: Me, Mandy from Mandy's Secrets, Ashley from Ashley Elizabeth's Beauty Blog, and Harri from Trailer Hood Chic. The Metro Atlanta Beauty Bloggers Meet Up! 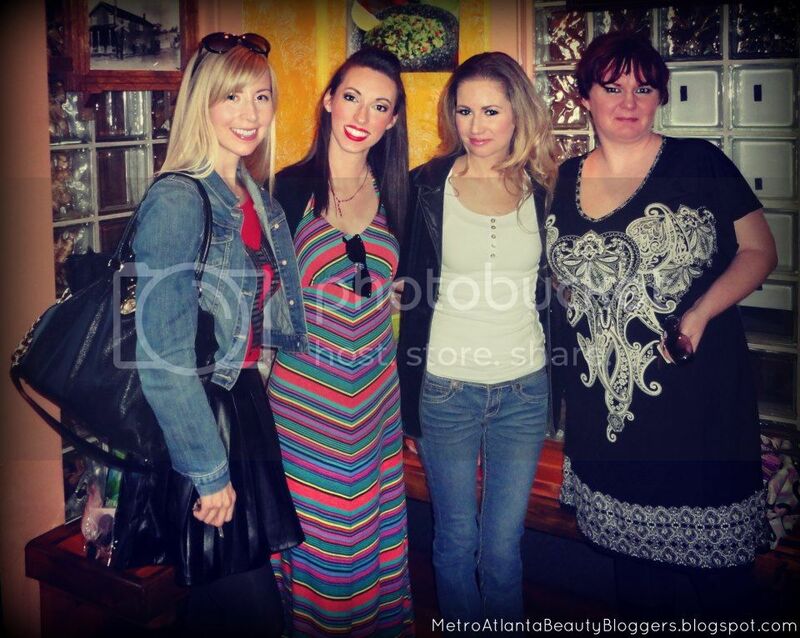 The following day, the Metro Atlanta Beauty Bloggers (MABB) had their first offical meet-up! Four of us were able to attend. We met at a Mexican resturant, discussed MABB business, and had a live makeup swap. While we are active and chatty on our MABB Facebook page, it was our first time meeting in person! I have met other MABB members at a previous event; however, it was my first time meeting the particular 3 other girls that met up on Sunday. Please continue to follow my MABB bi-weekly Questions!